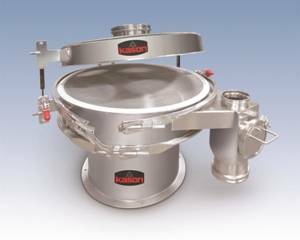 A new sanitary Vibroscreen Model K30-1-SS 76-cm screener that meets cGMP, 3-A, USDA and FDA standards, features sanitary stainless steel construction, gap-free screen frames with quick-disconnect clamps, flexible quick-action connectors at the inlet and outlet, a Clamshell lid, and a removable, sanitary magnet at the discharge spout, it was announced by Henry Alamzad, President, Kason. The external, interlocking flange configuration of the screen frame fully envelops the support ring of the screen, allowing the screen’s wire mesh to extend to the interior walls of the frame. The design eliminates the gap between the screen ring and frame wall of conventional screeners, eliminating areas where material would otherwise collect. “The gap-free design dramatically reduces the possibility of contamination due to bacteria growth, and improves sanitising efficiency, making it suitable for pharmaceutical, food and dairy applications, as well as other applications where cross-contamination is a concern,” says Alamzad. Screens are mounted to support rings using FDA-approved epoxy and sealed using FDA-approved gasket material, and can be provided with a mesh-tolerance certificate. The wire mesh screening material is offered in 304, 316 and “magnetic” 400-series stainless steel that, if broken, can be captured along with ferrous material contaminants, by a sanitary high-strength magnet at the discharge outlet. The Clamshell design allows the upper frame to be raised and held in the open position by gas pistons, providing easy access for rapid screen changes and thorough wash down of all interior surfaces, reducing downtime and allowing one operator to perform what was previously a two-person task, depending on screen diameter. The flexible connectors with sanitary BFM™ fittings snap into place inside the spigot rims of the material inlet and discharge spouts, allowing rapid disassembly and cleaning. The unit is constructed with continuous weld seams and material contact surfaces polished to a sanitary finish, and a 4-post, open base with stainless steel motor enclosure allowing wash down of the unit’s underside and plant floor. Also offered are configurations with a second spout on the upper frame for continuous discharge of the overs fraction. The company manufactures a broad range of other circular vibratory screeners, as well as centrifugal screeners, and circular fluid bed dryers, coolers and moisturisers.